Perspectives From a Southern Belle: BabyBond Nursing Accessories Review! I received this product a few weeks ago and gave it to a dear friend of mine who had just had a baby. It took me a little while to get my review written up because I had to interview her on her thoughts about the product. My initial thoughts when looking at the BabyBond was that it was an interesting idea. Cover the mom and not the baby.. the more I thought about it, the better it sounded. 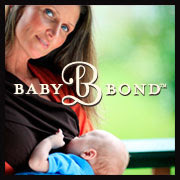 BabyBond Original is worn with shirts that are accessible to nurse from the top and has a built-in burpcloth and matching pouch storage pouch. BabyBond Flex is worn with shirts that are accessible to nurse from the top and has a removable burpcloth and matching pouch storage pouch. BabyBond Couture is adjustable and can be worn with shirts that are accessible to nurse from the top or the bottom. It rolls up into itself to store. BabyBond is machine washable, 100% cotton, and made in USA. My friend ABSOLUTELY loved this product. She loved the fact that she did not have to cover her baby up while nursing, but she could keep her modesty. This product accomplishes everything that it is trying to accomplish. She chose the couture style and thought that it was perfect and cute too! She said of all the baby things that she has received, this is her definite favorite thing! She would recommend this to anyone who is nursing. You may be wondering where can you buy one? The price is around $35.00 and they offer three different styles: Couture, Flex, and the Original. This is really neat my sister had a baby and I think I am going to check these out to get her one.